BR Naturals is proudly a Canadian company focused on producing high quality gourmet edible products. From cooking oils to superfoods, we work hard to stand by strict standards in growing and processing the best ingredients, with purity and quality our top priorities. 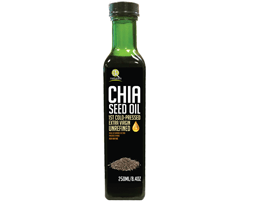 Our products are cold-pressed, raw and unrefined. All natural, non-GMO, great for home-made salad dressings, and whatever else you like. Avocados and their oil are packed with beneficial nutrients, containing vitamins A, B1, B2, C, D, E, K as well as beta-carotene, carotenoid lutein, potassium, lecithin, folic acid and beta-sitosterol. Avocado oil does not contain any trans-saturated fats or cholesterol. Both the fruit and the oil can be the backbone of a very healthy diet as they bring many health benefits to the table. They help in reducing the levels of unhealthy LDL-cholesterol in the body and increasing levels of healthy HDL-cholesterol, while aiding the body’s digestion of omega-3 fatty acids (obtained from other nutrients) thus helping to prevent obesity, diabetes, heart disease, Alzheimer’s and even cancer. Black Cumin seed oil is praised as being able to bring harmony to the body and help with many common ailments when ingested. The oil itself has a spicy, fragrant scent, and a flavour that is great for many curry dishes and even compliments some cold salads. 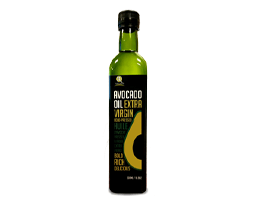 Our Gourmet Avocado oil is made with specially selected high grade Hass Avocado fruits. These avocados are pressed at the perfect ripeness, with the skin and pit removed, providing you a rich, deep green, flavourful oil. This specialty oil has a superb and distinct creamy avocado flavour making it perfect for dips, salads, and anything else you want to impress with. We cold-press our avocados to ensure you are getting the highest quality oil possible. It is rich in the vitamins and minerals that most oils lose when processed by heat and other methods that are common in commercial oil making. Give the gift of luxury with this beautifully designed, ceramic printed bottle, wax-dipped with our logo emblazoned upon the top. What Makes Our Avocado Oil Different? We hold our oil-making to extremely high standards. In the oil industry there are very few regulations involved to ensure that the oil you buy is pure (not mixed with anything else), nor that if a label says 'Extra Virgin Cold-Pressed' there is nothing to stop companies from refining, heating and filtering their oil and STILL making those claims on the label. At BR Naturals, we are acutely aware that this is happening in the industry, and doing everything we can to make products that are EXACTLY what we say they are, with no exceptions. Pumpkin Seed Oil is a power packed food containing many vitamins, minerals and unsaturated fatty acids. Pumpkin Seed Oil contains vitamins A, B1, B2, B6, C, D, E, and K, magnesium, iron, calcium, and Omega-3 and Omega-6 fatty acids. Pumpkin Seed Oil has been found to be helpful in preventing bladder and prostrate problems as well as intestinal parasites. Pumpkin Seed Oil has also been used to maintain weight loss, help relieve muscle fatigue, arthritis, and help regulate cholesterol levels. 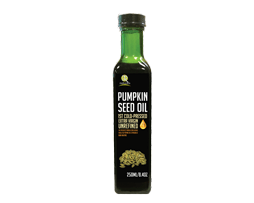 Pumpkin Seed Oil makes an excellent addition to salad dressing, especially the traditional Styrian salad dressing made with Pumpkin Seed Oil, cider vinegar and salt. A few drops of Pumpkin Seed Oil also impart a rich nutty flavor in desserts such as ice cream. When used as a cooking oil, Pumpkin Seed Oil imparts a strong nutty flavor but loses much of its nutritional value, so it is best to combine Pumpkin Seed Oil with other oils when using it as a cooking oil. If you’re looking for a cooking oil that’s suitable for high heat, safflower oil may be the right choice for you. It has a higher smoke point than corn oil, canola oil, olive oil, sesame oil, and many other alternatives. It also has a neutral flavor, making it an ideal choice for many recipes. Some of the health benefits of safflower oil include its ability to lower cholesterol levels, manage blood sugar, aid in weight loss, improve hair health, boost skin health, reduce the symptoms of PMS, control muscle contractions, and improve the immune system. 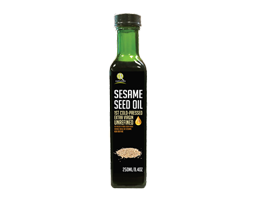 Sesame seed oil is a nice light oil with a high smoke point, making it great for deep frying and stirfrying meat and vegetables. It makes for a great flavour addition to salads and other dishes with it's light, nutty taste. Sesame oil offers a great profile of healthy fats, made of almost half monounsaturated fat, and half polyunsaturated fat. Only a small component comes from saturated fat, making this a great oil to use for anyone concerned with heart disease. Sesame oil is also a premier source of Vitamin E, which can further help to boost your health by combating free-radical damage. Great for cooking, and as a replacement for butter or margarine in baking. Eating coconut oil is said to help manage appetite, and aid in weight-loss. Coconut oil can also be used in first aid for cuts and scrapes because it is antibacterial, and acts as a natural moisturizer for hair and skin. Our Premium Olive Oil is made with specially selected olive fruits. This specialty oil has a rich, distinct flavour making it perfect for dips and salads. 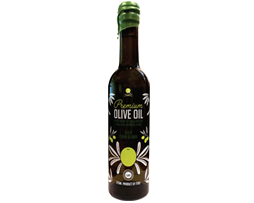 Our olives are cold-pressed to ensure you are getting the highest quality oil possible. It is rich in the vitamins and minerals that most oils lose when processed by heat and other methods that are common in commercial oil making. This premium bottle is ceramic-printed (no stuck on label) featuring an FDA approved (and FD&C approved colour), hand-dipped cap in a moisture-resistant wax to preserve freshness and flavour, finished with our official seal on the top. Made for 100% Chia Seed, this nutrient-rich staple can be used as a versatile ingredient in cooking due to its mild flavour. High in Protein and Omega 3 fatty acids, enjoy chia seeds for breakfast, smoothies, baking and homemade chocolate pudding! 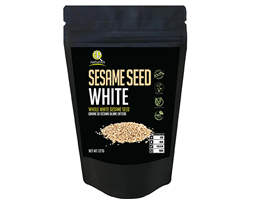 Sesame seeds are a great way to add extra flavour, fibre and nutrition to yogurt, oatmeal, baked goods, smoothies and traditional Asian cuisine. Our sesame seed powder is made from 100% ground sesame seeds, and is a great source of vitamins, minerals and daily nutrition. It can be added to oatmeal, salads, soups, stews, noodles, and is a great substitute ingredient for low-carb baking. Neem, also known as the “Miracle Tree”, is a great herb for supporting a healthy immune system and prized for its great health and beauty benefits. Best taken as a hot tea, or can be used as a polstice on skin to help reduce inflammation and pain. Moringa Oleifera leaves is 100% pure and has a pleasant, subtle taste. Moringa is a great herb for supporting excellent health & well-being. Moringa leaves can be used to make tea or be added into soups, curries and stews for a boost in nutrition. High in Protein, Potassium, Vitamins A & C, Calcium, Iron. Cold-milled Moringa Oleifera leaf powder. Our Moringa Powder is 100% pure and has a pleasant, green, and subtle taste. Moringa is considered a great herb for supporting excellent health and well-being. It also contains 25% protein, including all 9 essential amino acids. Moringa powder is a great addition to smoothies and sauces! Lemongrass possesses powerful antioxidants as well as plenty of calcium. Use it to make tea, enhance beverages, soups, curries and other culinary creations. A good source of Vitamin A, Calcium, Fibre, Magnesium, Iron, Folate, Zinc, Copper, Potassium, Phosphorus, and Manganese. 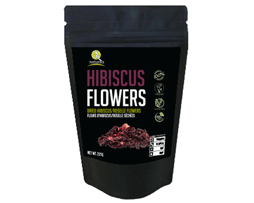 Hibiscus, also known as Roselle, is a wonderfully fragrant flower with a lemony-tart, berry flavour. Enjoy it as a hot tea with honey or to enhance cold beverages. It is loaded with antioxidants and vitamins beneficial for good health. Made from 100% Chia Seed, this nutrient-rich staple can be used as a versatile ingredient in cooking and baking due to its mild flavour and high fibre content. Use it in smoothies, cereals, soups and salads. Our Cacao powder is completley raw, and makes a great addition to desserts, smoothies, baked goods, ice cream and yogurt. Raw Cacao is the purest form of chocolate, rich in flavour and nutrients. Our cacao paste is derived through a cold-press process that preserves the delicate antioxidants, vitamins, minerals and flavours found in raw cacao. It can be added to smoothies, teas and desserts, and used to create elegant masterpieces such as ganaches and chocolate curls for cake decorating. Raw cacao nibs are the purest form of chocolate, rich in flavour and nutrients. Our cacao nibs are completely raw, and make a great addition to desserts, smoothies, baked goods, ice cream and yogurt. 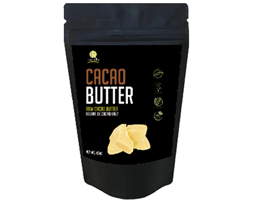 Our cacao butter has a smooth, silky texture and milk chocolate aroma. It is an ideal chocolate oil for both culinary and topical applications. Cacao butter is solid at room temperature and will melt at high temperatures.